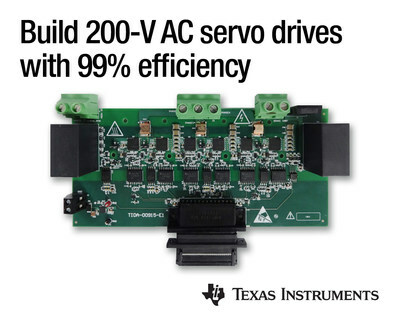 DALLAS, June 27, 2017 /PRNewswire/ -- Texas Instruments (TI) (NASDAQ: TXN) today introduced an innovative three-phase, gallium nitride (GaN)-based inverter reference design that helps engineers build 200-V, 2-kW AC servo motor drives and next-generation industrial robotics with fast current-loop control, higher efficiency, more accurate speed, and torque control. Download the reference design today. High-efficiency power stage: 98 percent at 100 kHz PWM, 99 percent at 24 kHz PWM reduce heat sink size. High pulse width modulation (PWM) frequency: High PWM switching frequency allows for driving low-inductance motor with minimum current ripple. Fast switching transition: Less than 25 ns without any switch node voltage ringing reduces EMI. Read the new white paper "High precision in motor drive control enables industrial advances." Learn more about the LMG3410 module, "Optimizing GaN performance with an integrated driver." Get more information about TI’s motor drive and smart grid infrastructure systems. controlSUITE is a trademark of Texas Instruments. All other trademarks belong to their respective owners.